SWAT® Original Fly Repellent Ointment is specially formulated to repel house, stable, face, and horn flies away from wound sites and sensitive areas such as the face and ears. Apply SWAT® in the areas around wounds, sores, scratches, and abrasions to help protect against biting and nuisance flies. Applied daily, SWAT® is the go-to solution for protecting sensitive and hard-to-reach areas from flies. Ideal for use on sensitive, hard-to-reach areas. 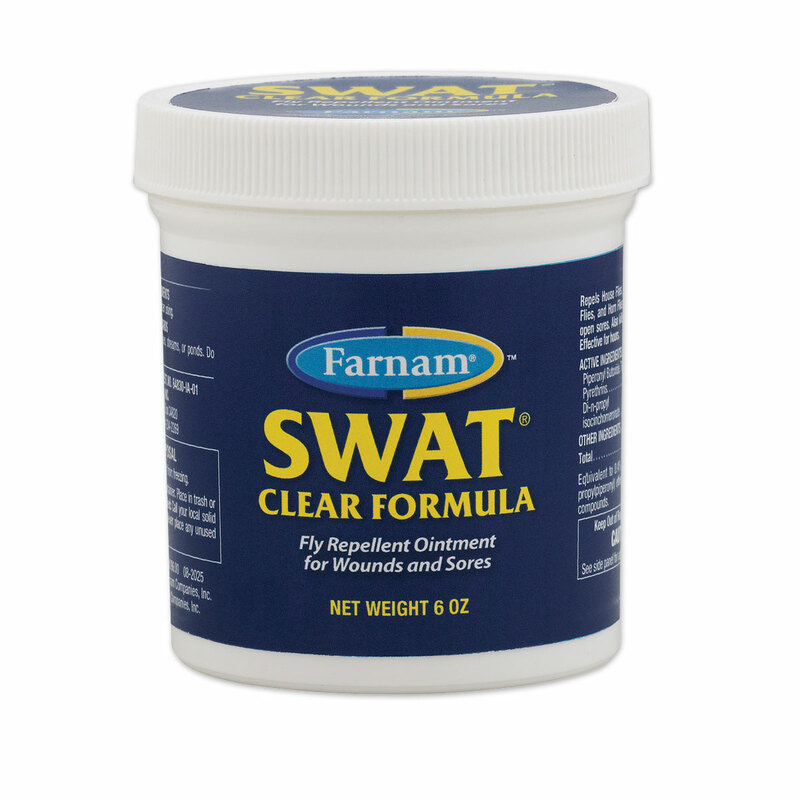 SWAT® Clear Fly Repellent Ointment is rated 4.8 out of 5 by 147. Rated 5 out of 5 by Chrissyj from Excellant product I would never be without it. The best product. I use it every year. It really works! Rated 5 out of 5 by Connie from One of my favorite products This is one of my favorite products, an antibiotic that keeps the flies away! Rated 5 out of 5 by Renay S from Works great! Flies have been so bad this spring that my horse and donkey had sores on their legs llowed the sores to heal. The donkey is a rescue and is very suspicious of anything new, he accepted the Swat very quickly and stood perfectly still for me to put it on all four legs. Rated 5 out of 5 by Tammij_g3 from BEST Fly repellent this is my go to when it comes to flies, especially around their legs. I have used sprays but SWAT is my most reliable fly repellent. I wish SWAT came in a spray. Rated 4 out of 5 by JEMac from Great for keeping bugs off! Keeps biting gnats and flies off. Also lasts several days. Only wish it came in a larger size! Rated 5 out of 5 by Jacque123 from Love this product No matter if it fly season or if you want to keep bugs away from cuts this product has been the best I have found! My mare loves it and it's easy to apply! I prefer clear over pink since I have a grey but I have found no different effects!